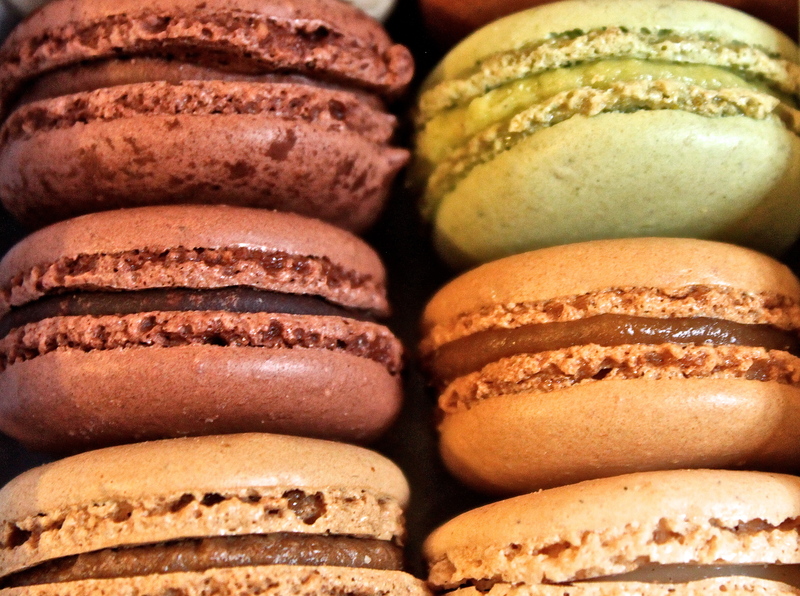 I love the French macaron. And to think, 4 years ago, I had never even heard of this whimsical creation. If you’ve never seen one, these charming double-deckered dots, look impossibly similar to multi-colored miniature hamburgers buns that you might find in your daughter’s dollhouse. They are gorgeous from top to bottom. While I like the unusual and trendy flavors (this season Ladurée is featuring les baies roses—pink peppercorns) and the fanciful colors, when it comes to macarons, it turns out I’m a plain-Jane-vanilla kind of girl. J’adore le parfum vanille—that, and the pistache. 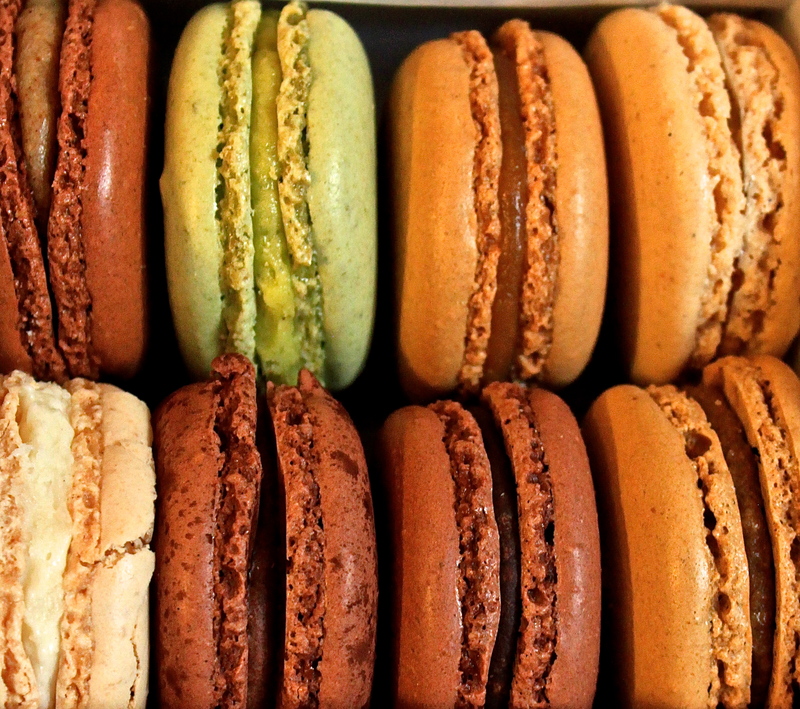 During my time in France, I have probably eaten at least one hundred of these colorful, cream-filled confections. Don’t tell Superman, but at €2.25 a pop, that’s roughly $300 worth of cookies. It’s my guilty pleasure, so sue me. There are several ways I like to eat them. I savor them in a cozy salon de thé with un café noisette, or depending on the flavors I order, a cup of chocolat chaud. I also love eating them on a park bench at lunchtime watching the world go by. Often I bring them home to the family as a special after dinner treat. This is my preferred method for enjoying les macarons. We usually share a box of 6-8, cutting them in quarters or halves, so we can all taste a bit of each. Sometimes I make the family close their eyes to try to figure out the flavor, other times I make them wait while I meticulously set them up for a photo shoot. I always suggest a sip of water to clear the palate between tastings. But the most important thing I have found to enjoy this indulgence is to make the time to relish every tiny bite…the taste, the smell, the texture and the view. 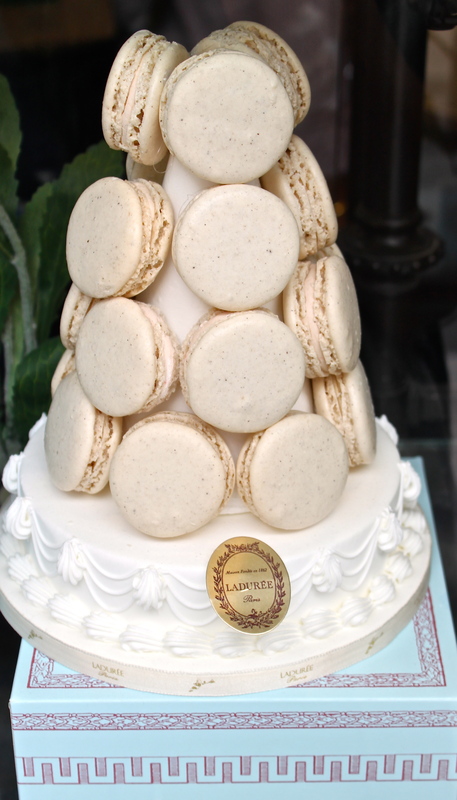 Les macarons are scrumptiously edible art, exquisite and very, very French. I’ll show your post to one of the women in my French class. She is a marvelous baker and last week she brought macarons to our class which she had made, flavored with rose petals from her garden. 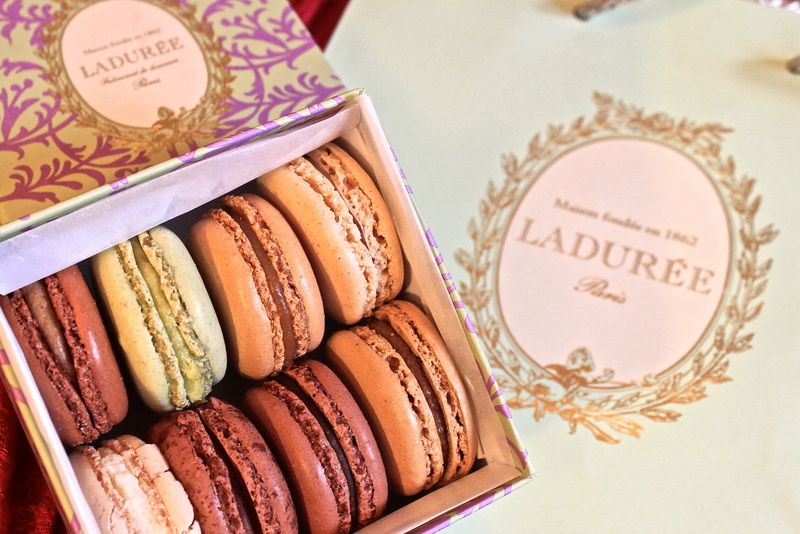 Our teacher (from Normandy) said they were as good as the macarons she has eaten in France. Your photos are scrumptious – the white ones look like a wedding cake! If you miss France have a look at my blog. Luckily, I’m still in France for at least another 8 months…then who knows what happens next. But I’ll certainly look at your blog and find out what you are up to. Thank you. Yes, I really need to make it to Pierre Hermé. I’ve actually been a little disappointed in Ladurée lately. Thank you for reading.